Notice the “map” link? Yup, clicking on that takes you to a map of the SFO airport, which is handy if you’re going somewhere new. 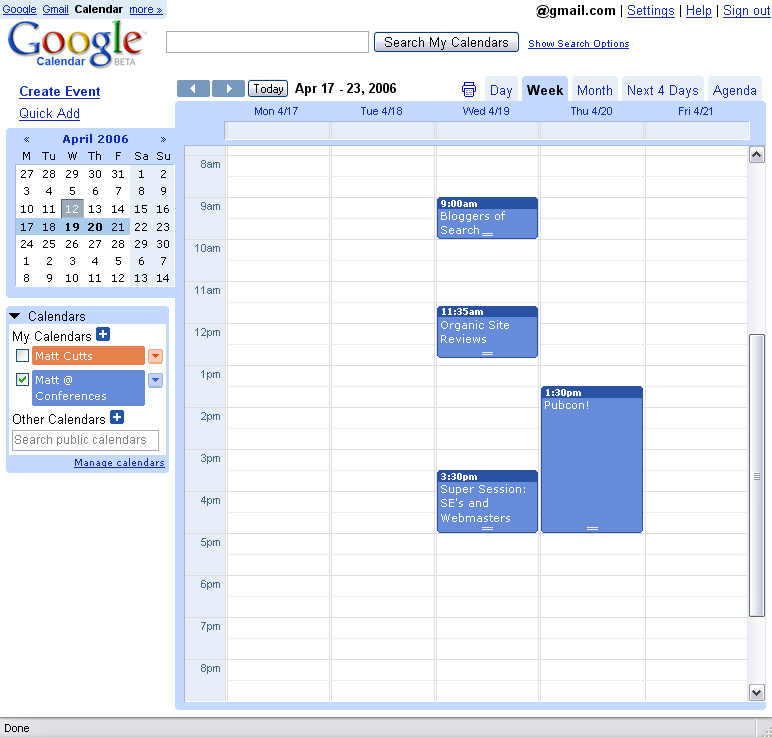 Integrating with Google Maps is nice, but I expect Google Calendar to really start to shine with Gmail. Have you noticed that if you’re using Gmail and someone sends you an address, you get the option on the right-hand side of the page to get a map for that address? In the same way, it sounds like Gmail will look for events and let you add them to your calendar. Meetings are resizeable (click on those little parallel lines at the bottom of events and just drag). You can also drag and drop a meeting to a different day. I like that you can keep multiple calendars (e.g. a personal calendar, a work calendar, a conference calendar), and you can color-code them however you like. It’s nice to be able to hide calendar layers, and I especially like the option to hide a meeting if you decline it (pet peeve: I hate seeing a meeting cluttering up my calendar when I know I’m not going to attend). Beyond the UI though, there’s a solid amount of import/export options. You can import Outlook calendar info, Apple iCal info, or Yahoo! Calendar info. And Google Calendar provides both XML and ICAL export. Going deeper, you can set a calendar to be world-viewable, or you can allow granular access to people you choose. – a discussion group where people are already posting mash-up questions like “Is there any way to post an event (preferably a Quick Add style post) either through some sort of API (for use with, for example, a Dashboard widget) or through some URL I can use (for use with e.g. YubNub)?” I’m sure the Calendar folks will be listening to feedback on what features people want the most. I’m an enthusiastic Gmail user, but some parts of it seemed pretty alien at first (labels instead of folders, threaded conversations) until you got used to them. But once you get used to using Gmail, it’s really productive. By comparison, the migration to Google Calendar feels like less hassle to me. My hunch is that the features and options will get even more polished over time. I like Google Calendar a lot so far, and I’m excited to see where it goes from here. So if you want to try Google Calendar, you can sign up now if you have a Gmail account. If you don’t have a Gmail account, read this page on how to sign up by getting a Google Account. P.S. My first request? A bookmarklet to let you select text on a web page and “QuickAdd” that event with smart parsing of the text. So in the post below, you could select “10 August 2006 Expected date of workshop” and click on the bookmarklet to add AIRWeb to your calendar in just a click or two. Okay, normally I don’t complain about just released products, but I can’t get into this thing! Either it times out, gives me a 502, or says, “Calendar is unavailable right now, please try again in a few moments”. Ack! Occasionally it has loaded, only to say it doesn’t work in Safari (and I stupidly clicked okay before reading the box when I should have clicked cancel). Anyway, it seems like you guys could throw a few more machines behind these services before launch, in order to guarantee a better first experience. I will say, though, the screenshots look good and using natural language to add events is sweet. As soon as I get it to load, I’m going to import my iCal calendars to check it out. Okay, I managed to get in with Camino. So far, it looks pretty sweet and I’ve been playing around with all the features. The thing I perhaps like the most is the navigation at the very top left. I didn’t notice that in your screenshot, and I don’t really need it, but I know a bunch of people complain that it is hard to navigate between all the services (they forget what all you offer). Glad it’s working for you now, Andrew. I’m sure the team is interested in getting Safari in good shape, but by market share I’m sure that most of the testing had to be in IE and Firefox; those were the two browsers that I tried. I think Google did a great job with its Calendar. Do you know whether its also available now in other languages? Any link handy to Danish for example? Don’t worry Matt, I understand why they wouldn’t concern themselves too much with Safari. IIRC, Maps didn’t work with Safari either when it was first released. I don’t mind launching Camino (I don’t use Firefox much anymore, unless I need extensions), if it isn’t already open after checking Analytics. Also, one thing I forgot to mention, I really like the Agenda feature. To my knowledge, iCal doesn’t have anything like this and it is a good way to get a grasp of my future. Now… I just need to remember to add events to my calendar. Cool news! I’m just using it now. It’s another nice product from Google. Where Google will arrive now? A new Operating System against MS? Do you see an option of having any google feature without having a GMAIL account? I do not see why I should need one, and there are other ways to register (like the way done for adwords, google sitemaps – although due to a recent change I can’t certify my sites anymore). The life if so complicated enough to have to register anywhere for something I already have with outlook..
Yah, I just discovered the Agenda view a little while ago, and it’s pretty nice. Also, that “Next 4 Days” can be changed to whatever number of days you want. And I discovered that you can click on the mini-month view and drag to select a variable number of days/weeks. The calendar is looking incredible so far, only one thing is keeping me from switching over from 30boxes currently… no SMS Verizon Wireless support? All of the other major carriers are listed except Verizon, is there any reason for this? I saw the settings for Agenda, but I thought 4 days sounded good :). Also, my friend is curious why Verizon isn’t listed in Carriers under cell phone notifications. He is disappointed he can’t use that. A million sunbird calendars just cried out in pain. I really like it… I’ve been waiting for Google to come out with this kind of thing for quite a while. It’s nice how I can import my existing ical calendars, but I wish you’d take the next step and allow iCal to publish directly to it, like can be done in .mac That would really make things nice! So when are you guys going to put all those nice tools together into a GOS (Google Operating System)? I’m trying it at http://clase4.blogspot.com/2006/04/google-calendar.html. Any chance of adding public holidays? See you at PubCon Matt! Does anyone know why when I enter [Good Friday], it abberviates it to [Good]? My dad noted that Google Calendar lacks a way to set up repeating events on Monday and Wednesday *only*. He can set stuff up for M,W,F, but his recurring events only happen on M,W. Finer grained control over this aspect might be beneficial. Ok, so let me get understand this correctly. Google knows all my blogs from Sitemaps. Has access to my entire conversation though Gmail. And now will know when I walk my dog? Warning: No wonder why our government wants access to this, it’s like a window into our lives and believe me, it is not about finding pedophiles. Note: I use pretty much all of Google’s free tools, they help organize my day. I tried to setup my cell phone info for SMS notifcations but I’ve waiting for about 15 minutes and still have not gotten the verification code. Other than that, I am very excited about Google Calendar! Seriously though.. they don’t have a lot of providers.. If they need a more updated list, have them email me.. I wrote the “free text message” module for personalized hompage that’s currently one of the top10 popular..I’d gladly share help them add more providers..
Also.. did I miss it? How do I drag an event to be multiple days? I added “Vegas” in my calendar.. but couldn’t drag it to the 4 days I’d be staying there. The multiple day event support seems clumsy at best. It should be more like this guy tried (and failed) to do… http://www.monket.net/cal His demo doesn’t work.. but his ideas look solid. Other than that.. great job. Looks nice! Any idea when the SMS provider list will be expanded? My carrier (Verizon) isn’t on the list. >>Does anyone know why when I enter [Good Friday], it abberviates it to [Good]? It would great to have this on my google.com/ig page! I guess i am going to get a little more organised now… nice! I like it so far but is there a way to add the calendar to the Google personalized home? german, you can sign up for Calendar without a Gmail account. It’s called a Google Account when you do this. I think the last link in the post talks about how to do it. Okay, must get ready for work..
Pubcon ending at 5pm?! Better fix THAT typo! You’ve done it again Googl! Brilliant stuff. I think this integration of an intuitive online calendar with email will bring PDA style organization to regular folks in a way it’s never been done before. Only recommend would be offline processing of both calendar and emails. wow.. I don’t think I ever posted here as “hockeygod”.. which means Matt is paying closer attention than we think to the links on our names.. Although Adam did out my alias on a different topic when discussing his hedir site.. I guess I missed that feature of the calendar.. to be honest I only played with it for about 15 minutes.. It’s lunch time now.. i’ll play some more. Tell them to hurry up the API.. I”ve got some great ideas once they launch it… it’ll finally give me something to do with my “schedulemywife.com” domain name thats’ been sitting around unused… How useful would that be!! It’s a cross referenced and pretty printed version of the Google Calender source code. I’ve also included a bookmarklet in the above page to allow you to “Add Another Date Picker” to the Google Calendar navigation bar as a proof of concept. Am I the only one that was expecting some kind of public HTML URL as well as XML & iCal feeds? Just took a look at it, very very nice. Feels just right, like gmail. I can get comfortable with this real soon. PS: What’s the mini-month view? And how do I resize that? Has anyone figured out yet how to put a link to the Google Calendar on your personalized Google homepage?? I’m feeling lucky search for “failure”. Seriously Ryan, you oughta bring in that noslang thing to the job interview. That site rocks. Is there, or will there eventually be, calendar sharing a la Exchange Server? Great stuff, Phil. I saw the link on digg last night, but it was like 2 a.m. so I didn’t read through it then. Ryan, if if makes you feel better, I had already noticed that your comments were insightful (along with HockeyGod) and clicked on your link to check it out. You have HockeyGod right on the destination page, so that’s how I knew. If it helps, I just mailed the recruiter asking to let me put in a good word for you. Surfdog, I think XML/ICAL feeds are tucked away in the options (both import and export). Shajith, I called it the mini-month view because I didn’t know the official name. It’s a month view, and it’s small (left hand side of the page, above the calendars), so I called it the mini-month view. The main thing is that you can click and drag over there to select a custom number of days/weeks to look at. Which is neat. 🙂 I almost didn’t bother taking the tour, but then I did, and they mention that on the first page or two. Have you seen Spongecell.com? We’ve won several natural language shoot-outs (vs Google Calendar and 30 boxes), and have exposed our NLP through a new API. Today we announced an iPod sync tool. I think this could be a valuable feature – intergrating Calander and Gmail. ….Going deeper, you can set a calendar to be world-viewable, or you can allow granular access to people you choose. It’s not a bookmarklet, but it’s a greasemonkey script that will parse hCalendar microformats and add them to your Google Calendar. Calendar rocks! I’m sure we will be seeing many improvements and enhancements. It needs to have everything the competitors offer. I would love to see a color coding feature as well as the repeating event option. In my opinion: This is one of the best offerings of real use to many people. One feature of 30boxes I wish this had was the ability to automatically include your upcoming.org events. Thanks for the good word Matt.. I really appreciate it. It’s my dream to work at Google.. The interview seemd to go well, then he told me he’s looking for somebody with more professional experience (i’m only 24). In which case.. I’m confused why they even called. Anyway.. he sent me a word doc with some basic programmign questions in it.. I’ll be sending it back to him by monday…. Hopefully they can find a job for me.. I’ll pretty much take anything…… maybe you know of somebody else I should submit the resume too..
anyway.. I’m done with all but the last question.. it’s a time consuming one.. I should get back to it..
Its cool that G is launching so many treats, but it would make my day if I could get Analytics that I signed up for at PubCon in November. Good luck, Ryan. Hope it goes okay. This has got to be one of the best Google products released, and in Beta too! I’ve been waiting for this day for a long time! I just imported 250 events from my SunBird iCal format Calendar and it got everything in there, I am impressed! It’s the smoothness of the web app that does it for me! Everything seems to flow so well, just like Gmail and Google Maps. The integration with their existing applications is great. I can’t wait to see what they will tweak next in their Calendar! I already have a google account. I had an adword last year, have an access to the control panel and to sitemaps. (I gave up adwords 2 weeks afterneath because I couldn’t ban for a keyword and for my keyword there is so much competition that I couldn’t cope with banning them all, somethimes seing the list of the banned list being removed (too long)). What I am concerned about is however about the cookies it sends to me (because obviously I am checking for some results and I don’t want to have them biased to please me). I logged out, removed the cookies. I am now refusing to log in to anything that would send any more cookies to my computer. I have at the moment no less than 14 cookies for google, 4 for matt cutts. For some of them, it is impossible to remove them. Even if I remove them and tell firefox “do not accept them anymore”, they are loaded everytime. Funny thing is since I removed some cookies, when i search google.at, I lost the function “pages in Austria” but If I look at google.de, I can get “pages in Germany” (or the german equivalent). I get the feeling that this was an answer for removing the cookies on my computer although Google is accessing me on the IP address (and can obviously locate me). It is like Yahoo, one you want something, you have a yahoo account, once you download something, you get the whole range of yahoo things installed on your computer. I don’t see the point of Google needing my e-mail for a calendar, nor I see the point that i should get even more cookies. I like the things but I am getting fanatical about cookies. If it is free, let me download it and use offline – but I do not want any installed program sending informations in the background on the basis of the cookies that I can’t remove. Google needs to put a repeating events on its calendar. For example on the 1st of every month to remind me about article writing and every Thursday to play chess at the coffee house. Another nice edition would be a separate to do list. why so tripped out about cookies? It can only store in a cookie what it already knows about you.. They could just secretly throw all that information into a database behind the scenes and require you to log in every time.. would that be better? Using the cookie, at least you have more control over the information they store. With this new bookmarklet you no longer need to construct the reminder buttons by hand or reenter the information elsewhere. I’ve updated the hack notes a little also. Google Calendar rocks — but I can’t use it for business because it won’t sync with Outlook and it doesn’t work with Hosted Gmail. Like a lot of people, I use Outlook as the desktop client, POPing my email from Gmail For Your Domain. I’m not giving up Outlook, and there’s no way to sync Outlook events with Google Calendar. Sure, I could do a one-time export from Outlook, but then what about the next meeting I add or change? Seems to me that Google Desktop already has an Outlook Addin (Tools>Options>Other>Advanced>COM Addins) that watches for email sent and received to sync with Desktop. Would it be that hard to extend the Desktop addin to sync appointments with Calendar? If I try to keep a business calendar and a personal calendar in two different places my life would be chaos. Bi-directional integratoin with Outlook has got to be a top priority. Oh, and what about opening up Google Calendar to us Hosted Gmail users? will return a pre-populated “edit event page”. So, the latter will be enough for a Firefox-style keyword add (with no “intelligent” parsing”) but the former still needs to routed via a compose request. It may not take much to hack this up in GreaseMonkey, but I’ll continue looking at the bookmarklet approach. Matt you might want to tell the Google Calendar Team that the daily agenda email is still sending out the CL2 logo and not the new Google Calendar one. Why I don’t like cookies? Because I get so many of them. I am working on the internet the whole day long, looking at pages in google as a dictionnary, somethimes being redirected, having pages for web hosting, cars sales, dating or worse in the background all the time. I don’t like cookies and if google would ask for a password for it search, it would be the end of Google. I need the internet as a library for terminology and sometimes whats it offers me is not even printed in books. If i can’t access it free, there are other sources. I try to seo my pages myself to with some success. I think the end of SEO will be the day when a search machine is using all the informations about last previewed search and offering them as first result. As every client is probably looking at most at his own website, he will say, I am first on google, i don’t have to pay so much for SEO. Then he tries on a friend computer and after 3-4 times looking on it, he will get the page as 1st result if corresponding to his search (and probably won’t be asking more than a couple of friends before believing that any people sees him first). In the end, nobody will know what is the truth or not and SEOing a site will place a site on the first place making it even more difficult to know if it is because you have already gone to this site or because for Google find your site the best. -SEO will be made difficult without having to empty all traces of previous search on your computer every time. I am working with google.ch, google.de, google.at, google.fr, google.co.uk and google.be if necessary because of some changes in the terminology. If google is Geotargeting what I am usually looking for and through my IP adress, it may make my search more difficult (because what I am most looking for is something local of another country). Cookies/IP targetting are very bad for me if they help to change the result. The sites that I look or click at are neither a sign that I liked the site or that it will be for use in the future. It was just looking for the particular use of a particular word in a particular context. That’s why I will try as much as possible that google has not too much access to my cache/cookies or has a way to make my IP adress relevant to a particular set of results. …And the day I removed the cookie with my GUID, the result for my page suddendly went to page 3 to page 7. I hate Geotargeting. The appt location/conference room does not display (without clicking) in either the main page, or when printing the calendar. In order to make this work for me, I’d have to hand enter all the locations in the topic field. Any chance the actual location field could be displayed/printed instead of the link to google maps. Is there a way to back up your calendar data offline? Just took a look at it, very very nice. Feels just right, like gmail. I can get comfortable with this real soon. I guess i am going to get a little more organised now… nice! Been looking for this calendar for years, Thanks Goooogle! Now can someone ask the Google toolbar guys to add a calendar button. PLEASE! I think the calendar feature is great. My wife has been saying for a while now that she wanted Google to have a calendar LOL. It would be usefull recurrent events, separated to do list (for the task that not have a temporary scope) and free sticky notes would be nice too. Hellelujah Surfdog! The only comment on this issue that I’ve seen so far, surprisingly. So here’s the scenario – I want to publish a calendar on my website; my visitor’s can 1) click on a link to download an ical file (must have a supporting application); 2) click on an xml feed link (rediculous) or 3) click on a link asking them to sign up to Google Calendar. A html link seems like an obvious feature to me. Would this feature be useful to anyone apart from myself and Surfdog? Add me to the list of those who are anxious to see it on the Personalized Home Page. And I also agree that having an option for recurrance would be great as well. I’ve imported a fairly light calendar just to test it, but I wonder if we can export as well? Thanks for this – I have been looking for a diary like this for ages. Thank you Google, and thanks Matt for providing the link. Anybody else having huge problems with all-day / no-time events? I can’t figure out the pattern, but some of the ones I created in iCal (and then imported into gCal) are completely messed up on the iCal subscription of my gCal (it’s all convoluted so I can rig a sync between my Treo and my gCal) but some of them are okay. I think I was able to get the whole thing working as a Firefox Extension. I don’t think you can do it as a bookmarklet. I have really enjoyed using the new calendar and have started using it as my GTD task manager. It works very well in this manner. Once I have completed a task I move it to the completed calendar named Daily Journal. I named it Journal because I wanted a place to put all of my completed daily activites, even ones that I had not yet created. Google Calendar is absolutely fantastic, I’ve ditched my old calendar software already. I resonate with the concern of Surfdog, I think I am now the second person to want to figure out how to have some kind of public HTML URL just like the one offered by yahoo. I have been using for quite some time the yahoo cal, and the public HTML URL has been one of its best features ever. I wonder if Google would be able to have one like it aside from iCal and XMS. Hey matt, great site – curious – do u know if there is a way to import a calender from a word “table” to Google Calnder? My boss does a monthly schedule on a word table and I’d love to import it day-by-day onto the google calender. Its seems to me quite good.But i want to know about its versatilities that it could be work in any other browser such as Firefox,opera or not? We have been using the Google calendar feature in our answering service since its inception. Tons of people are using g-mail now and we use the online calendar feature to set appointments for customers. Its a really nice interface & people really seem to like the idea of waking up & having their day already mapped out for them. I put together a guide for synchronizing Microsoft Outlook, Gmail, Google Calendar, iPod and mobile phone / cell phone using ScheduleWorld and Funambol. Really a great feature by google. Nice Mr.matt, you are helping a lot people to find the best solutions in the world. many people dosen’t know about this feature i guess. Calendar is good and smart, easy and simple so its nice. if it have the mobile feature is good. how do you suggest matt. Is there a way to create a LIST OF EVENTS in Google Calendar? Quite some time ago, I used a calendaring system where I could set up a list of events, tied to one entry. In other words, I could enter an “COMPLETION DATE” (let’s say 12/31/2007) for a project, and it would automatically enter a series of dates leading up to that date, for certain checkpoints (based on the list that I defined ahead of time). Can Gcal do something like this? should say “construction project”, or TRIAL being the example above. Hi, The calendar is looking incredible so far, only one thing is keeping me from switching over from 30boxes currently… no SMS Verizon Wireless support? All of the other major carriers are listed except Verizon, is there any reason for this? Hi, Has anyone figured out yet how to put a link to the Google Calendar on your personalized Google homepage?? I’ve found some bugs in google calendar. The worst one was adding appointment hundreds of times! but how do the map work? just clicking on it shows the whole of North America. There seems to be no possibility of making in point at whatever point you are interested in. I have tried, and save maps, but there seem to be at least two places to save your own maps and none of them are connected with the calender. When you share the “Edit all functions” with someone else and they edit your calendar for you on REMINDERS by adding an SMS reminder. The SMS is sent to the persons calendar that the edit is made from and not the person’s calendar you are trying to edit. I was really surprised that this bug has still not been picked up. Maybe everyone was just the same as me and just found it far too difficult to try and report this bug to G.
Does anyone know if you can set up an appointment by click and dragging a contact into your calendar with google? I would like to use it to set up appointments for my dog grooming business.